Home » Blog » Empire of the Sun 2nd Edition arrived! 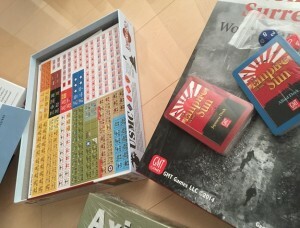 Empire of the Sun 2nd Edition arrived! Yes, finally, my box with the Empire of the Sun 2nd Edition has arrived home! I could not wait to open it and admire the components. GMT always produce high quality counters and components in general and this time is not an exception. The counters are lovely and colorful. The main change is that now the Imperial Japanese Navy uses white background for counters and red for written combat and movement factors. The ground forces and planes that depend on the Army not Navy) are still in the classical yellow color. I think it tries to visualize that cooperation was not always good between Army and Navy so they acted sometimes in a different and non-cooperative mode. This is quite well represented in the game mechanics. I would like to review more deeply some games using EoTS in a near future so I will try to post some pics from each one when I set up the initial forces for each scenario. 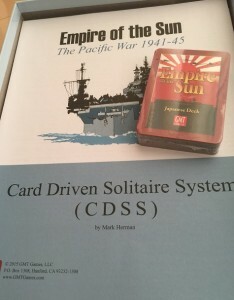 Empire of the sun is card driven system. The cards are light and beautifully done. The counters are very well-done too. 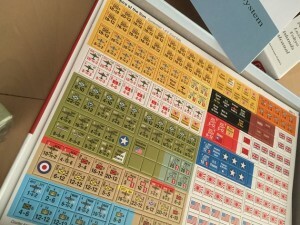 Japanese Army and Navy now have different colors, white and yellow, instead of only yellow in the 1st edition. 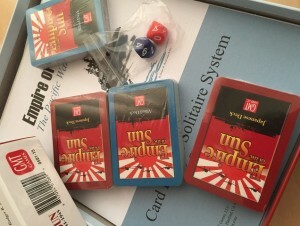 The 2nd edition of Empire of the sun comes with an innovative solitaire system. I cant wait to play it.